When faced with the inevitable most of us decide between burial and cremation for our beloved horses. For some however there is a third option, taxidermy. 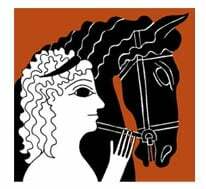 The practice is centuries old historically relegated to the regal WARHorses of kings but an option today for anyone who can afford it. Of course the end result may not be a faithful representation of your former heels-kickin’ pal depending upon the skillset of your taxidermist. 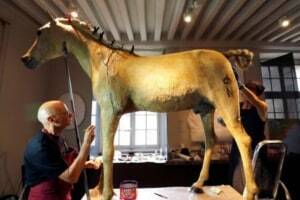 Below are a few of the most well known taxidermy horses around the world – inspirations should you be considering taxidermy (nota bene: Misty and Stormy – GAK). 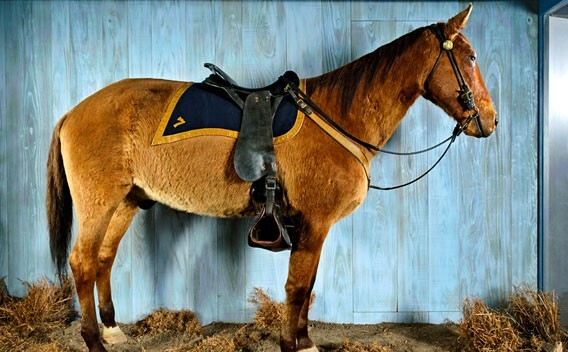 BUTTERMILK was the buckskin Quarter Horse that belonged to cowgirl movie and TV star Dale Evans. Evans rode Buttermilk in the 1950’s TV series, “The Roy Rogers Show”. Buttermilk (and Trigger) were very popular and became huge marketing advents spawning dozens of products for kids and adults. 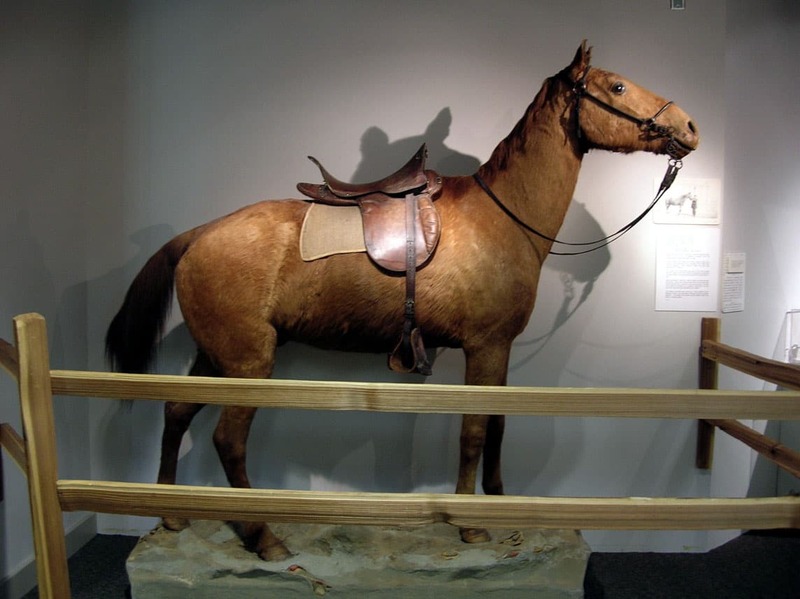 Buttermilk was last seen on display at the Roy Roger and Dale Evans Museum in Missouri but his whereabouts are unknown after the museum closed in 2009. COMANCHE was the sole survivor of the U.S. Cavalry in 1876 Battle of Little Big Horn. As soldiers picked their way through the dead and destruction on Custer Hill, they heard a faint whinny from what was left of Comanche. 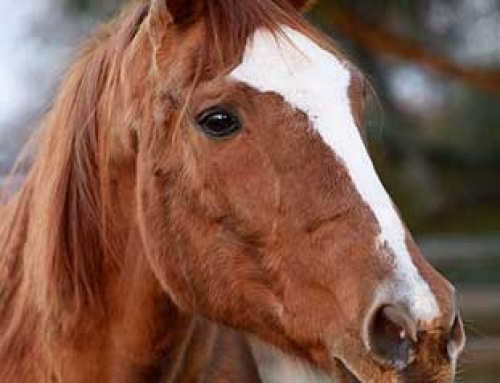 The blood and gore spattered horse had at least seven wounds, but none of them fatal. Comanche lived for another 15 years. Comanche is on display at the Kansas University’s Natural History Museum in Lawrence, Kansas. 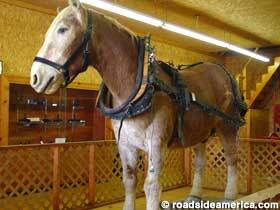 GENERAL is the largest taxidermy horse in the world. 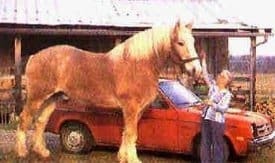 In life he was the third heaviest (2850 pounds) and third tallest (six feet, six inches) horse ever recorded. His reputation was for being gentle as a puppy. He is currently at the Virginia State Farm Museum in Point Pleasant, West Virginia. 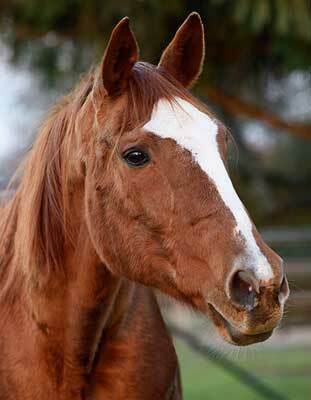 LITTLE SORREL was Stonewall Jackson’s warhorse. 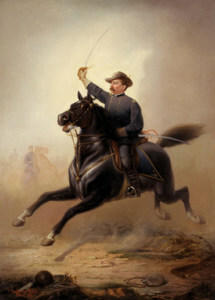 The small Morgan rode into more battles than any other horse during the Civil War. Little Sorrel was known to lay down on the picket line and receive apples fed to him by the soldiers. After surviving the war, he earned a reputation for being a rascal with a mouth that could undo latches, let down bars and liberate every horse in the barn. 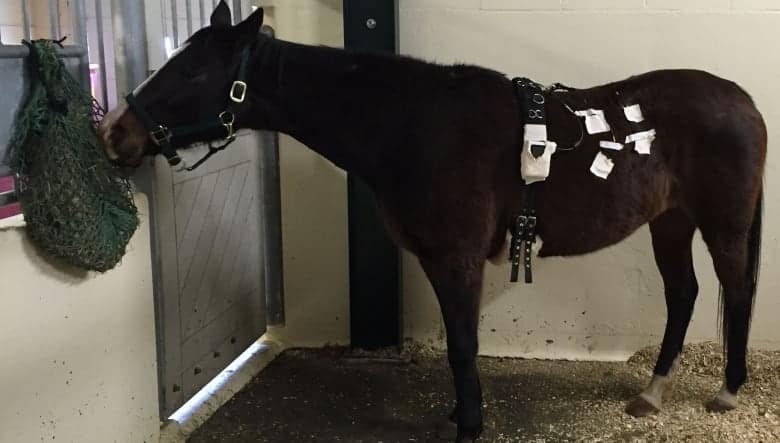 Little Sorrel is currently displayed at the Virginia Military Institute Museum, Lexington, Virginia. 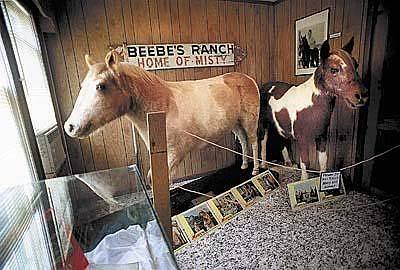 MISTY & STORMY are the real life horses on which author, Marguerite Henry, based her children’s books “Misty of Chincoteague and “Stormy”. In reality, Misty was domestically bred. Stormy was one of three foals from Misty. 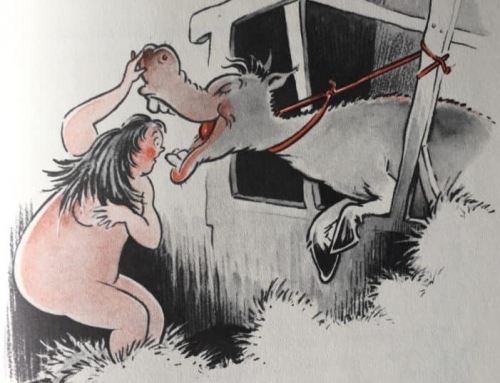 The book “Misty” was a runner up for the 1947 Newbery Medal for excellence in publishing. 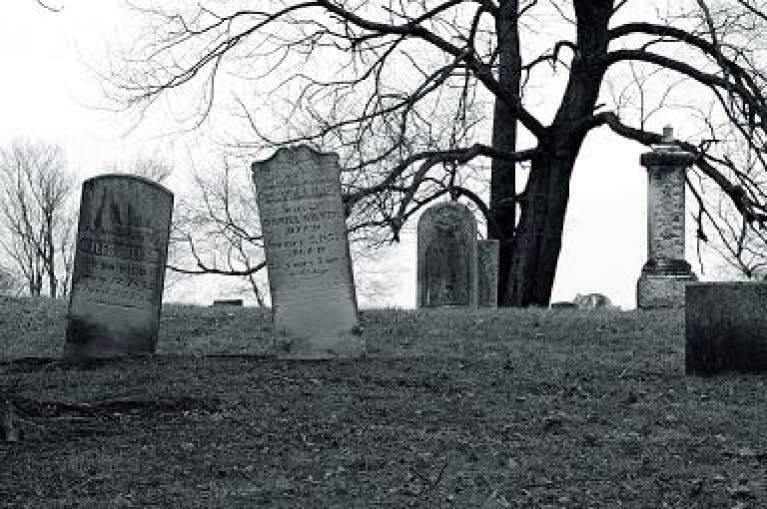 Misty died in 1972, Stormy in 1993. 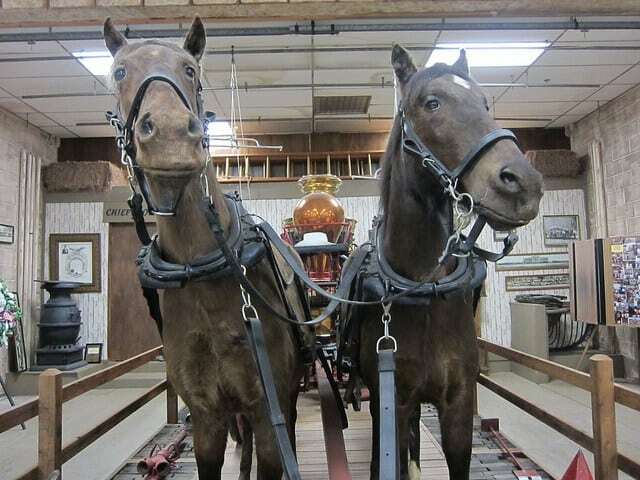 Both horses are displayed at the Museum of Chincoteague on Chincoteague Island, Virginia. 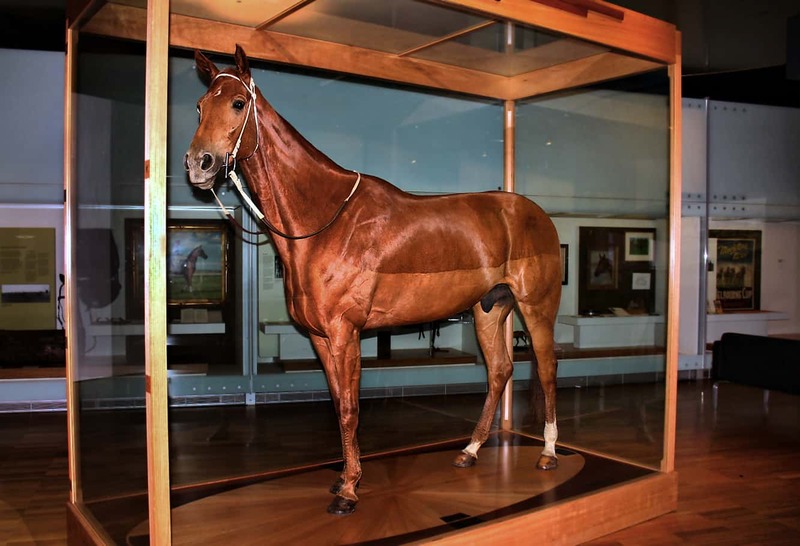 PHAR LAP bred in New Zealand he because the depression era wonder-horse of Australia. In 1930 he won the Melbourne Stakes and three days later the Melbourne Cup. He died suspiciously at the age of eight. Rumors abound that he was poisoned by American mobsters to prevent betting losses by illegal bookies. SAM & DON are forever hitched to a 19th century horse-drawn steam engine. 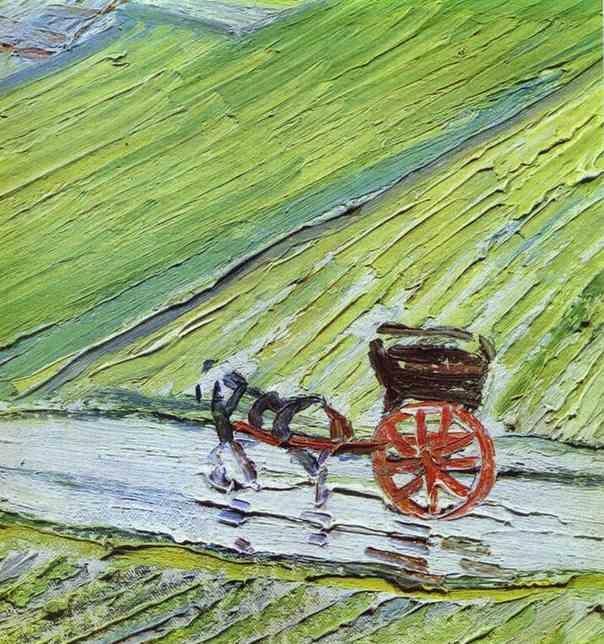 A team of horses or mules would carry water to the scene of a fire, a fireman would drive them from the small metal chair at the top. When filled, the cart weighed several thousand pounds. These former firefighters currently reside at the Oklahoma State Firefighters Museum in Oklahoma City, Oklahoma. STREIFF was the chestnut stallion of King Gustavus Adolpus II.King Gustav rode Streiff during the battle of Lutzen in 1632. 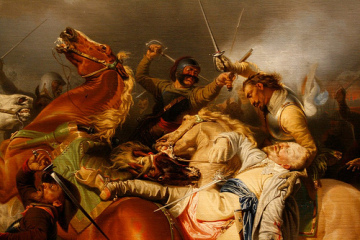 The king was killed and Streiff mortally wounded, dying a month later while in route home. His skin was prepared the following year by a local taxidermist wearing the King’s saddle and tack. 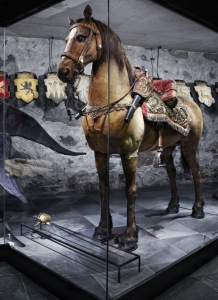 The Livruskammaren Museum in Stockholm, Sweden is home to this former King’s noble steed. 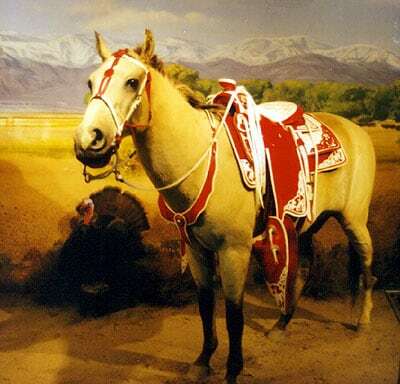 TRIGGER was a palomino made famous in American Western films by his owner/rider Roy Rogers. He learned more than 150 trick cues and was such a ham on set, that when he heard applause he would bow of his own accord. Trigger died in 1965. Trigger is on display at the corporate office of RFD-TV in Omaha, Nebraska. 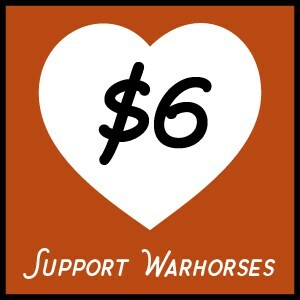 WARPAINT is an honored member of the ProRodeo Hall of Fame. Born wild he was rounded up from the Klamath Indian Reservation in Oregon and became the greatest saddle bronco of his generation. 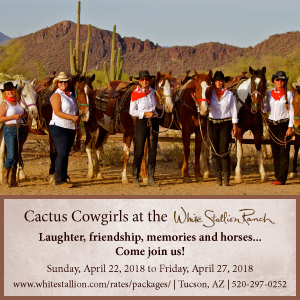 He retired after 20 years in rodeos with a 90% buck-off rate. He died in 1975. 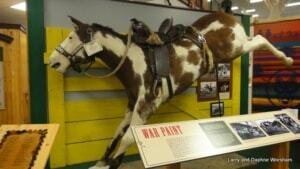 Warpaint is on display at the Pendleton Roundup and Happy Canyon Hall of Fame in Pendleton, Oregon. 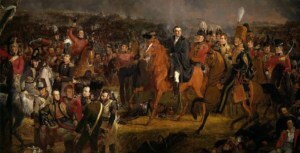 WEXY was the military mount of 23-year old, Prince William of Orange of the Netherlands at the battle of Waterloo in 1815. The prince was wounded during the final stages of the battle. 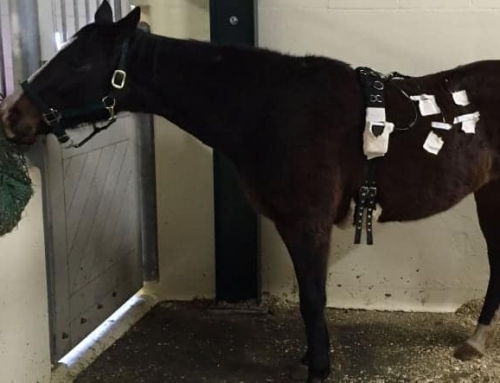 He dismounted to receive treatment. In his absence, Wexy was killed by enemy fire, one of 20,000 horses killed or maimed during the battle. 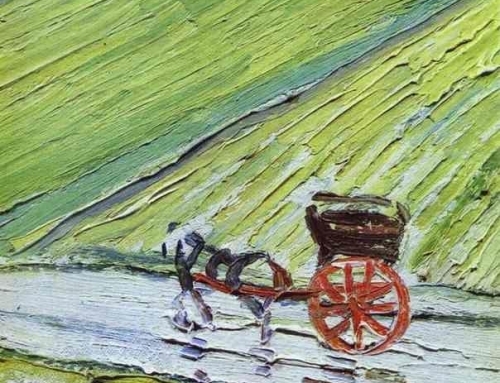 Recovered from the battlefield, Wexy now resides at the Rijksmuseum in Amsterdam, The Netherlands. 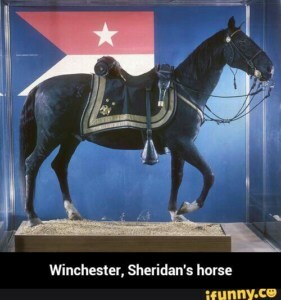 WINCHESTER (also called Rienzi) was a magnificent 16 hand high jet black Morgan gelding and the mount of Union General Phil Sheridan during the American Civil War. They rode together for three years, in 45 engagements, 19 out right battles and 2 raids. Winchester is displayed at the Smithsonian National Museum of American History in Washington, DC. 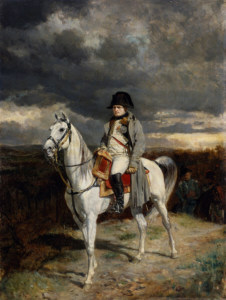 LE VIRZI was one of Napoleon Bonaparte’s favorite mounts. 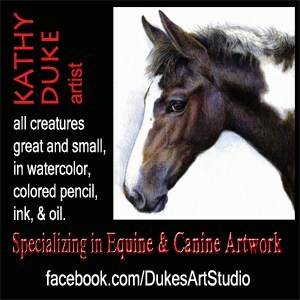 He was a petite, white, Arabian stallion who carried the emperor into many battles. Retired long before Napoleon’s defeat at Waterloo, he lived to be 33 cared for by a French officer at the Imperial Stables. After his death his taxidermied body was smuggled back and forth between England and France. 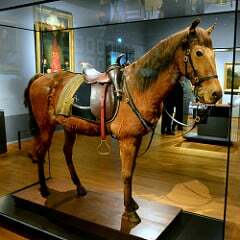 He was recently restored (READ our WARHorse post) and on display at the Army Museum in Paris. Italian artist Maurizio Cattelan has raised more than a few eyebrows with his use of taxidermy animals, including horses, as art. In 2001, his stuffed racehorse titled “La Ballata di Trotsky” sold at Christie’s London auction house for £619,750. 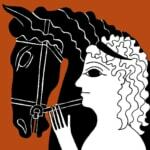 The mare, named Tiramisu, died of natural causes. Cattelan stretched her pelt over a light-weight frame as his intent was that she hang from the ceiling. Her legs were deliberately elongated to add to the pathos.